Summary. The functions, conditions of implementation of the institutionalization process of the scientific branch of education management and its essence as an indicator of development of the theory of education management are considered. Key words: institutionalization of science, education management, development of the theory of education management. Science is a complex, multifaceted phenomenon that can be considered from different points of view: cultural, logic-gnosiological, activity orientated, practical, informational, institutional, etc. From the institutional point of view − it is a special social institution that provides sustainability and certainty to social relations and, at the same time, accelerates social development. The institutional character of activity means that in the modern era scientific activity is hierarchical, has complex organizational forms, is based on a special material base, a system of special methods . The phenomenon of institutionalization, types, functions of social institutions are studied by sociology since its formation as a science. Institutionalization of continuous education in Ukraine is considered in the works by V. Andrushchenko, I. Gancherenok, Z. Zhukovska, L. Kvasova, V. Frolov, V. Senashenko, O. Sidorenko, T. Topchyi et al; the works by V. Andrushchenko, O. Antonova, S. Vitvytska, L. Gorbunova, M. Zubrytska, K. Korsak, M. Kultaeva, S. Kurbatov, N. Myronchuk, N. Sydorchuk and others are devoted to the development of higher education institutions; some aspects of the institutionalization of the science of education management are considered in the writings by O. Adamenko, V. Lunyacheka, E. Khrykova. E. Khrykov determines the institutionalization of the development of pedagogical science among its criteria. The foundation of the Academy of Pedagogical Sciences, systems of research institutes, specialized councils for the defense of dissertations, periodical professional publications refer to these criteria . In our opinion, this is not a complete list of indicators of institutionalization. However, indeed, institutionalization is an important factor in the development of scientific theory. The purpose of the article is to determine the main vectors of the analysis of the institutional organization of science of education management as indicators of the development of theory of education management. communicative function – is aimed at providing links, communication, interaction between scientists at the expense of a certain organization of their joint cooperation, exchange of scientific ideas, results of scientific activity. social institutions cover a certain set of people and institutions that are to address the important tasks for the development of society . For example, the institute of education implements its activity in education, upbringing, vocational training through schools, universities, etc. ; the institute of science envisages the presence of scientific activity in educational institutions, the existence of research centers, scientific institutes, etc., and others. Creation of new knowledge has always been in the structure of education, since many teachers and educators have always been engaged in this. Ancient Greek prototypes of future higher education institutions knowingly focused on the creation of new scientific knowledge − the Academy of Plato, Lyceum Aristotle, the Pythagorean Union. However, the research activity was incidental to the education system for a long time, in which the best humanistic and scholastic sciences developed until the XIX century. Natural and scientific knowledge evolved not only outside the education system, but often outside the official science. Institutional research function took shape in the era of the industrial revolution in the late XVIII – early XIX century. It was at this time that intense research in the natural sciences began. In general, the implementation of this function is concentrated at the higher level of the education system. At the end of the XIX century the responsibilities of the teaching staff of higher educational institutions included the simultaneous fulfilling the role of a researcher and a teacher, and they themselves began to focus on fundamental, and subsequently – applied research. The academic level of research of educational problems is usually carried out by university departments, primarily at national pedagogical universities. Among the academic institutions studying the problems of education management, the undisputed leadership belongs to the Academy of Pedagogical Sciences of Ukraine (APSU of Ukraine). This „highest state scientific institution” was established in 1992. Among the network of institutes, which unites the APS of Ukraine, the special role in the study of education management issues belongs to the institutes of pedagogy, pedagogical education and adult education, the Central Institute of Postgraduate Education and its affiliates, the Institute of Higher Education . Therefore, the development of a system of institutions and establishments, where the problems of education management are studied, is a prerequisite for the development of the theory of education management. An integral part of this process is the formation of a scientific community that deals with the study of education management issues. First and foremost, this is the training of scientific staff on the basis of higher education institutions. The theory of education management is developing as a component of pedagogical theory. An important indication of the specialization of scientific theory of education management is the distinction in 2005 specialty 13.00.06 − „Theory and methodology of education management” in the List of specialties. The dissertation works for scientific degrees of the candidate of sciences and doctor of sciences are defended, the award of scientific degrees and the assignment of scientists titles; foundation and functioning of three specialized councils for the defense of theses in this specialty. Also, the basis for the development of scientific staff in this specialty was the launching the master's degree in the field of „Management of an educational institution” at the national higher educational institutions in the 90s years of the twentieth century. Today, such training is being conducted in more than 25 pedagogical universities of Ukraine and 6 higher educational establishments of non-pedagogical orientation . Objective need, perceived in society as the universal one. A well-known social researcher G. Lensky identified the key social needs that generate the processes of institutionalization: the need for communication (language, education, communication, transport); the need for the production of goods and services; the need for the distribution of benefits and privileges; the need for citizens' safety, protection of their lives and well-being; the need to support the system of inequality (placement of social groups by positions, statuses, etc. ); the need for social control over the behavior of members of society (religion, morals, law) . Let us consider the realization of these needs in accordance with the institutionalization of science in the management of education. So the need for communication is realized through seminars, conferences, symposiums, workshops on issues of education management, publication of research results in specialized periodical, professional and amateur scientific journals. Also important is the need for the production of goods and services, which requires the acquisition of scientific knowledge that will ensure the management of education at the present stage of development of domestic society and in accordance with the world trends in education. Requirements for the distribution of benefits and privileges; security of citizens, protection of their lives and well-being; the need to support the system of inequality is realized due to the hierarchy of scientific and pedagogical positions in the system of education, the awarding of scientific degrees and degrees in the corresponding specialty. The need for social control is realized through public and state structures that direct scientific and pedagogical activity in this field. So, government agencies include information and analytical centers, advisory councils, specialized councils for the defense of dissertations, and so on. Public structures of science management in our country have not yet developed. They can be public associations, unions, etc. International donor organizations and research funding funds may also have a controlling role. The presence of a special, inherent in a specific institution of the cultural environment (subculture) − a system of values, social norms and rules that determine the purpose of its activity. Acting within institutions and within different social roles associated with specific social positions (statuses), these rules allow, propose or prohibit certain types of behavior that makes people's actions expedient, useful and unidirectional. 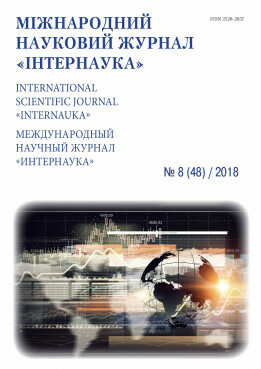 For example, in the scientific sphere there are certain peculiarities of the culture of communication with the use of scientific language, ethical principles regarding the reliability of scientific results, their originality, observance of copyright of scholars, review of scientific publications, etc. From this point of view, institutionalization is the adoption cultural norms, values, standards, regulating various aspects of human activity, supporting fulfilling the needs, acceptable behavior by an individual or a group. Availability of the necessary resources (material, financial, labor, organizational), which society must consistently replenish by investing in institutions and training. Thus, the institutional organization of science in the management of education, like most social sciences, has the following forms: academic institutions that deal with research on education management (research centers, research institutes, etc. ); educational systems that reproduce the relevant scientific staff (universities, institutes); state structures that direct scientific and pedagogical activities in this field (information and analytical centers, advisory councils, specialized councils for the defense of dissertations); public organizations that deal with education management issues (academies, associations, consortia, unions); permanent workshops and periodic conferences, symposiums, working meetings on the issues of education management; specialized professional scientific publications; international donor organizations and foundations that support research on education management issues. The analysis of these development vectors provides an opportunity to form an idea of the position of the institutional organization of the science of education management in Ukraine as an indicator of the development of national theory of education management. Герасимчук А. А. Соціологія: навч. посібник / А.А. Герасимчук, Ю. І. Палеха, О.М. Шиян; Європейський ун-т. – К.: Видавництво Європейського ун-ту, 2004. – 246 с. : табл. Хриков Є. М. Методологія педагогічного дослідження : монографія / Є. М. Хриков. – Харків: ФОП Панов А.М., 2017. – 237 с.